This exclusive Rotary ladies' gold PVD multifunction watch features a gorgeous stone set bezel and mother of pearl dial. The dial features day, date and moonphase readouts, giving excellent functionality wrapped in classic, glamorous design. 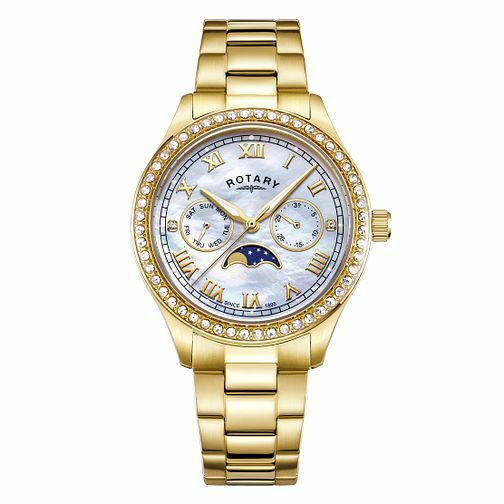 Rotary Ladies' Mother of Pearl Dial Gold Plated Watch is rated 4.8 out of 5 by 8. Rated 5 out of 5 by Anonymous from Rotary Ladies watch Very stylish and half price. Very happy with my choice! Rated 4 out of 5 by Anonymous from Overall a good watch The watch was a gift for my girlfriend. She liked the look of it, but we are unsure about the functionality of the moon/sun dial. We have asked at store and was advised that it would work. So far it isn’t working as we thought it might (daily) and seems to go round in a monthly cycle. Will have to investigate further in store.